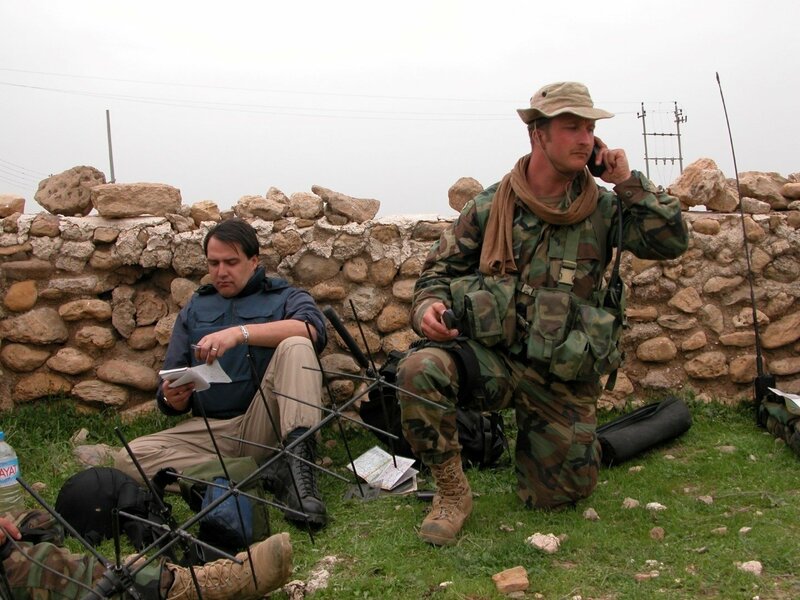 US reporter Chris Kline shares his story about becoming a war journalist and the unexpected consequences of this choice. “War is the ugliest thing human beings do, but it removes all the artifice from one's perspectives. Weirdly though you see the worst of human behaviour you also see the best of the human spirit that extreme circumstances bring to the fore. A sense of brotherhood and sisterhood you find nowhere else in quite the same way and it's a very deep bond. This rather than the adrenaline rush of danger is what I find addictive”, says Chris Kline, a war journalist from the USA, who will teach at Kaunas University of Technology (KTU) this semester. 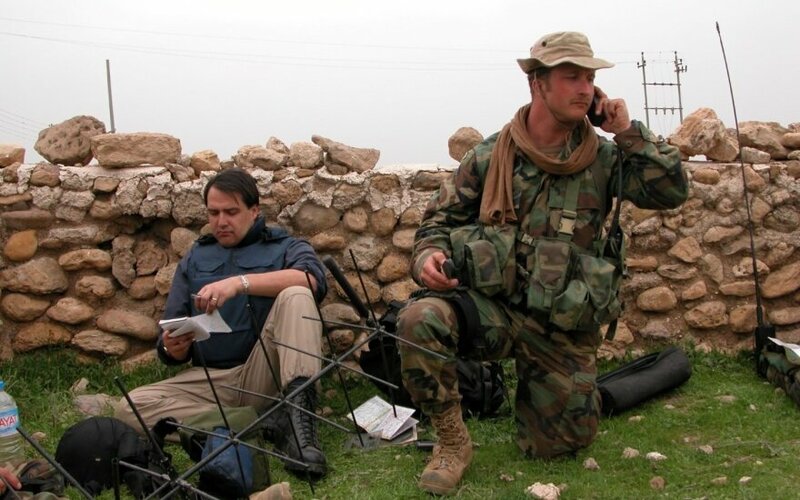 American veteran war correspondent Kline is an independent war and investigative journalist who worked with CNN International, ABC News and Fox News. He will share his experience and professional insights in a cycle of seminars during the Radio and television internet media course at the KTU Faculty of Informatics. 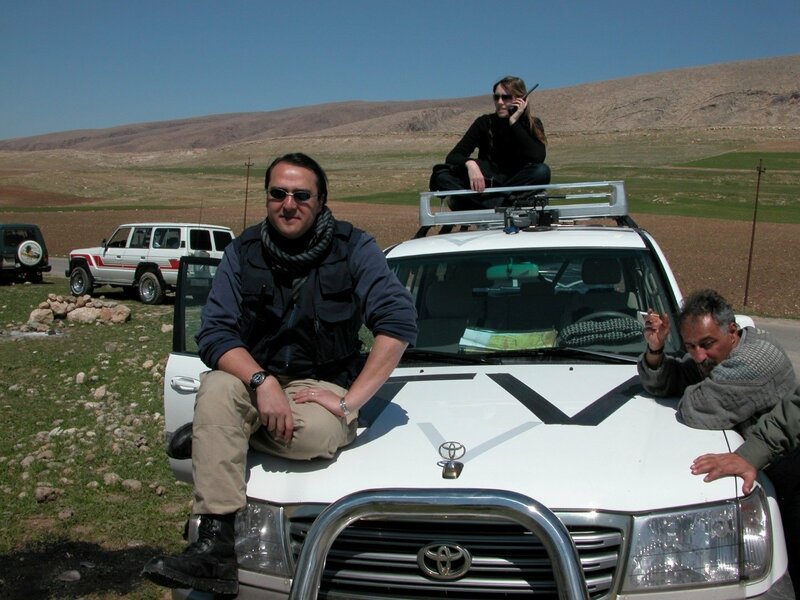 How did you choose to become a war correspondent? I always wanted to be a journalist and told my family I would become a foreign correspondent and war reporter when I was nine years old. I always knew it was my calling. I come from a family of people in the performing arts: my father was a theatre and film actor and my mother was an opera singer, my aunt was also an actress and playwright and my uncle while a distinguished psychologist was also an accomplished poet. So in different formats storytelling is very much in the genes, as is a sense of drama, of life writ large. There were also many architects in my family, as well as academics and notably one revolutionary, as well as one pirate in the ancestral line! But throughout the history of America there have also been many soldiers, naval officers and military aviators both professionals and citizen soldiers who answered their country's call in wartime, beginning in our Revolution and War of Independence in 1776. So there is a warrior gene in our tribe too. I nearly joined the US Marines but then considered that I was probably too much of a non-comformist to do well in a military environment. Grounded in a love of history my whole life, especially its upheavals and conflicts, I needed to see history unfold before my very eyes. Were there any other factors that influenced your choice? Before moving to America, I grew up as a boy in Franco's Spain, until I was ten years old I lived under Fascism and that early memory of oppression and fear stayed with me and I felt a natural instinct to fight it. I also spent my early childhood in Italy when Italy was on the brink of both a revolution and a military takeover just before the era of the Red Brigades terror. I would often witness massive riots in the streets when I was just a little boy, street battles between demonstrators and the Carabinieri (the paramilitary police) and I was fascinated by the strange spectacle, I didn't turn away and I think the seed of a future war reporter germinated then. I wanted to be a witness. Late CBS newsman Richard C. Hottelet, one of America's Great War correspondents of the Second World War, was further a huge influence on me. He was a long-time family friend and I always hungered to hear his war stories. He was in Normandy on D-Day, parachuted into Germany on the first day of the Allied crossing of the Rhine and was also one the first American war correspondents to enter Berlin as the Nazi capital fell. He was my hero and he still is and I wanted to follow in his footsteps. Were you ever in a situation where your life was in danger? In Chechnya, in Iraq and Afghanistan there were numerous occasions when together with my crew I faced mortal danger, I can't even count them all, it is the occupational hazard of any war reporter and I am sad to say I have lost friends on the battlefield. Sometimes the danger is all around you, but because somehow it doesn't touch you, it creates a sense that you are leading a charmed life, that magically you are protected, but you aren't really, it's a form of conscious denial, and it is necessary to a degree, because if you became so paralyzed by fear, you wouldn't be able to function. It's a fine balance in fact, respect for a hostile environment in wartime, situational awareness is crucial, to fully grasp that you are in a place of sudden, violent death, is necessary, and this is nothing other than fear, but you learn to control that fear and that fear held in check keeps you sharp, keeps you alert and sharpens your instincts for survival. You were present in the most war conflicts of the modern world. Which of them were the most memorable? What human qualities war reveals? Once in Iraq I actually had to reach for a pistol to defend myself. I did not enjoy the experience. I missed being captured by the Russian Army in Chechnya once by all of five minutes and I have no doubt that I would have been shot on the spot, as occurred to British friend of mine in similar circumstances. The second modern Russo-Chechen War is still the worse thing I ever saw, as it was also nothing less than a genocide, out of a population of only 1 million Chechens, the Russians killed over 200 000 and the world did nothing and I am not entirely sure why I came out alive. I remember very clearly a terrible night where I sat in a barn by myself next to farm animals terrified by the sound of artillery as they bellowed in fear, and I gently wept and thought to myself with certainty I would never make it home. It's strange those life and death moments, it's all too real and thus also surreal when it's happening to you. On another occasion in Iraq, myself and my producer and cameraman, we narrowly missed being hit once by a 120mm mortar round that would have left us in pieces, so much meat. But we all laughed about it later and here to paraphrase Churchill, there is indeed a great exultation to be felt to be shot at with no result. On this subject I always loved what my American godmother once told me "courage is fear that has said its prayers." But unlike soldiers war reporters are on a battlefield by choice and we can leave when we want to, so I have a lot of respect for combat soldiers that don't have that luxury and I have formed many close friendships with them. War is not fun, it's the ugliest thing human beings do, but it removes all the artifice from one's perspectives, because it is life or death, there's no room or time for fools and weirdly though you see the worst of human behaviour you also see the best of the human spirit that extreme circumstances bring to the fore, tremendous bravery, selfless sacrifice, real heroism, compassion even, strange as that is and above all a camaraderie, a sense of brotherhood and sisterhood you find nowhere else in quite the same way, and it's a very deep bond and this rather than the adrenaline rush of danger is what I find addictive. What was the most memorable experience you had while working in Caucasus, Iraq, Afghanistan or other places? Again there are too many memorable events seared in the mind's eye forever of having witnessed war to mention here, some are good memories and some are dark nightmares. One of the worst I remember was listening to the cries of wounded Iraqi soldiers as they screamed beneath the rubble of their bunker I had just watched being bombed from an American fighter plane. I was a few hundred meters away and they sounded like they were right next to me. It's hard to convey in words the horror of that moment. I also have always been haunted by the plight of animals in war zones, it's not that I care about the loss of human life less, but they are so helpless. There was a dying donkey once in Kurdistan and it was in agony and I begged the special forces soldiers I was attached to, to shoot it to put it out of its misery, but they couldn't because they were afraid of drawing enemy fire, the sound of their mercy shot might have alerted the enemy to fire in our direction. All of the moments of camaraderie with my fellow field journalists, soldiers or guerrillas or civilians helping me I was with are my happiest recollections always but perhaps the most morally perplexing moment also came in Iraq. I was in Mosul just as the city had fallen and overnight militia's cropped up everywhere and it was a free fire zone, the small arms gunfire was intense and it was in every direction. I ended up trapped with a small team of US Commandos in a hospital just outside their emergency room. An ambulance would show up every few minutes with a fresh civilian casualty, the paramedics wild eyed with shock and trauma and every other person on the stretchers being rushed in for surgery was already dead on arrival. I saw a beautiful woman in her mid-thirties, truly beautiful but half of the top of her head was missing. 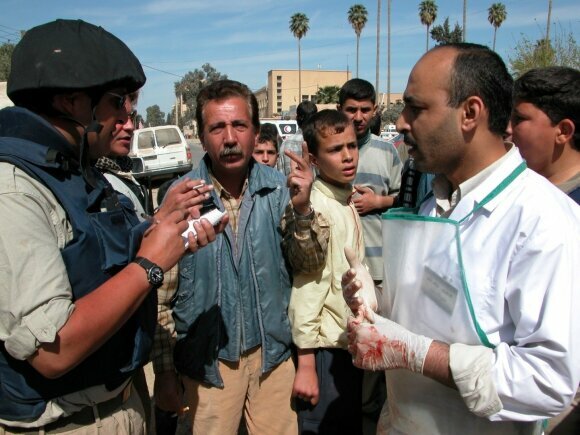 When a doctor understood I was American, he came out to challenge me, to vent his anger, he spoke perfect English, his hospital whites were drenched in blood, he then started pounding his chest in grief shouting at me, yelling "is this the democracy you brought us!" I had no answer for him, I still don't. How did you manage to adapt to normal life after coming back from war? It's hard when you come back to normal civilian life after experiencing war and it is no different for war reporters, humanitarian aid workers who operate in conflict zones, soldiers who fight or the civilians trapped in war zones, because we are all human and this is also why I wish we would see more compassion for the refugees fleeing Iraq, Syria, Afghanistan and Sudan and other hellish places. Being a war reporter cost me my marriage. And I did come back from Chechnya suffering from Post Traumatic Stress Disorder though I did get psychiatric treatment for it and it was very helpful and I did go back to war again after and I still will one or two more times, but I understand that soon I have to hand over to the next generation of war reporters and try to build a more peaceful life, since I am no longer young and I am lucky enough to have a second chance at love and I am in Lithuania for no other reason that I fell in love with a Lithuanian woman. But once you see war, it stays with you, the memory cannot be erased. And though I am cured of my PTSD, it's like alcoholism once you have it, you always will have some vestige, just like a recovered alcoholic is always an alcoholic even if he or she never takes another drink. So for me, I am not a big fan of fireworks, I can't stand to be in one of my home states in the USA during hunting season because the sound of gunfire puts me on edge. Do you ever thing of coming back to war? The strange Pavlovian response I still have is that the sound of a helicopter overhead still gets me excited, gets my blood up, the wolf rises in the throat when I hear the distinctive sound of helo rotor blades, it is the classic sound of modern war. I have ridden in combat helicopters, taken fire in them and also run and hidden from them. There is an MI8 helicopter the Lithuanian Air Force routinely flies over Kaunas on search and rescue duty and whenever I hear it, I feel like I want to grab my helmet and flak vest and get on board and go to war again. The hardest thing about coming back to a peacetime setting after war is that all seems a bit unfamiliar because the war zone is the home you left behind, the tempo and nature of that existence which is completely different, so the real world so to speak seems alien. You also can feel very impatient and intolerant of stupidity and bad behaviour, you have seen people live or die in the wink of an eye and you yourself have taken decisions that easily could have been your last moments. Those decisions focus your mind on the things that truly matter, the core essence of human existence, universal things, eternal things, things deep in the spirit, often well beyond words to convey and it is what you understand as the ultimate reality and then you cannot comprehend things in our more mundane day to day existence as holding the importance that they do, petty jealousy, vanity, consumerism, all sorts of material or superficial concerns. How this experience changed your attitude towards fellow human beings? You can't understand how anyone could possibly be angry or stressed out over things like shopping and you feel a bit like a Martian. When you have seen real cruelty as well, seen real barbarism, real horror, indescribable suffering and pain, madness and then you see the ordinary, routine rudeness or lack of respect, lack of kindness, you see on the street, in public space, well, you lose all patience for it and respect for people that strike you as small and completely trivial in their conduct. You feel like shaking them and shouting at them to "wake up!" Part of this too is that I have a very hostile view towards bureaucracy and rote thinking. Life is too short and when you understand better just how fragile it is, how unpredictable it can be, how quickly you can go from joy to grief, delight to terror, then having seen war forces you to demand the best of life and you more readily are dismissive of what you come to regard as extraneous. War turns some people into monsters, into cold hearted killers, but oddly it can also awaken a deeper humanistic spirit a greater desire to do good and of course also to be treated better and to live life more fully, precisely because it is so precious a gift. My favourite line of any war novel is from Michael Herr's Dispatches. "The dead know only one thing, it is better to be alive." And so if you are lucky enough to be alive, what are you going to do with the limited amount of time on this earth you have? Worry about the latest fashions? Not me. I'd rather smell the roses.